Are you ready for Halloween? For our family, this is a very special Halloween – our first one since Reya joined our family. With a dog that absolutely loves children, we know Halloween is going to be a major treat for her. While some dogs are scared of uniforms and costumes, Reya just goes with the flow, making her perfect for some Halloween trick-or-treater greeting fun. Now all we need is an adorable costume and we will be ready to go! The only problem is that unlike everyone else, she really doesn’t have any special Halloween treats for herself. While I could probably find some Halloween ‘treats’ for her, I know most of these are just as much a junk food as candy is for humans. If I want some yummy AND healthy rewards for Reya, I know I’m going to have to make my own homemade dog treats! When I first decided to start looking for homemade dog treat recipes, I didn’t realize I was very quickly going to run into a roadblock. Most homemade recipes include peanut butter. While this may not be a big deal for most families, it is a major one for this cook since I’m allergic to peanuts. Even worse, I really couldn’t find a recipe that met most of my standards, meaning I was going to have to come up with my own homemade dog treat recipe! After a bit of experimentation, I finally came up with the perfect recipe that was high in nutrients and not too fattening for my favorite pup. 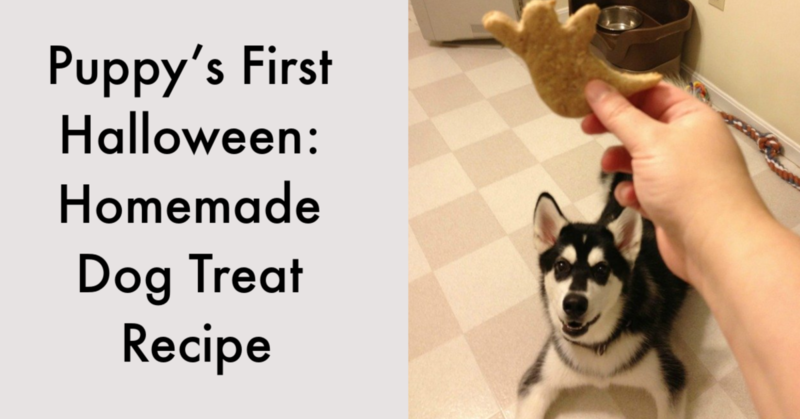 Even better, my homemade dog treat recipe is super easy to make and when combined with Wilson’s cookie cutters, made the perfect Halloween treat for my puppy! While I am giving this recipe a Halloween flair, I want to point out that this recipe is perfect for every season. Since the ingredients are things you can normally find your kitchen, it takes less than fifteen minutes to prepare these recipes. It is (of course) perfectly fine to use a bone cookie butter or any other cookie cutter you have in your home. Mix together all the wet ingredients. If you use measuring bowls, I prefer using one my bowl that does 1/4 and 1/2 cup measurements. 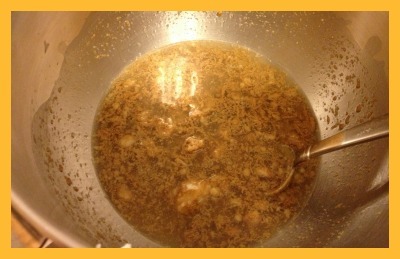 If you start with the chicken broth, the honey and sunflower butter will easy come out of the bowl. Add the coconut oil to the mixture and stir well. Like the sunflower butter, coconut oil is filled with vitamin E and other wonderful nutrients that help keep your dog’s coat shiny and healthy! Add the dry ingredients to the mixture. Stir well using a stand mixer or hand mixer. 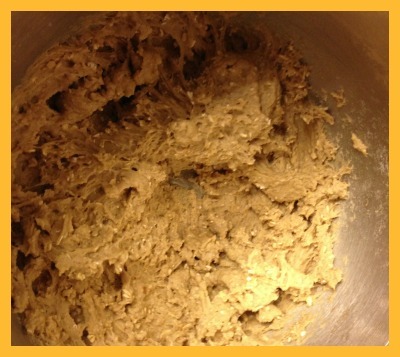 This mixture should be wet and sticky, but able to hold together easily on its own. Flour your hands and counter. 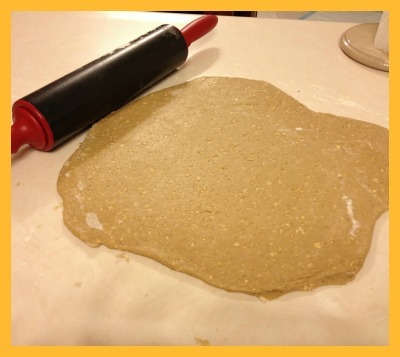 Remove the mixture from the bowl and roll using a rolling pin on your floured surface. Roll until the mixture is about a 1/4 inch thick. 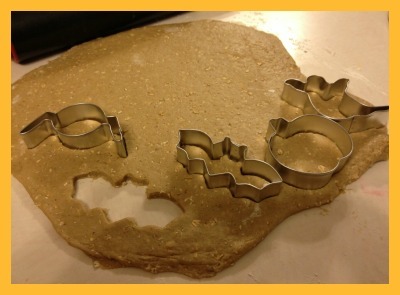 Using your preferred cookie cutters, start cutting out the cookies. I am using Wilson’s Halloween Cookie Cutters. 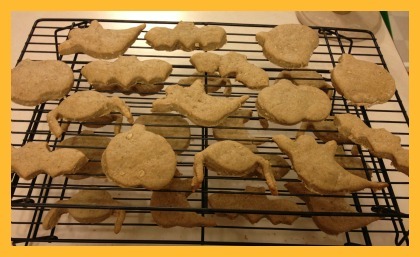 All of my cookies are in the shapes of bats, spiders, ghosts, or pumpkins. Keep rolling and cutting out cookies until the dough is finished. Place on a metal cookie sheet and bake 15 minutes. When finished, the cookies will be slightly raised and you will barely see the oats. Cool on a cooling rack for 15 minutes before serving to your dog. So, what does Reya think of this recipe? Well, as you can see from the picture below, she is a real ghostbuster! After eating this ghost, she was begging for more! If you are looking for an easy homemade dog treat recipe, I highly recommend giving this recipe a try! I do not have a dog right now but these look so cute!! What a lucky pup. I hope your pup enjoys them! I left the plate of cookies on the counter and Reya has been begging for them all morning! Just make sure you tell everyone in your house they are for the dog since they do look like sugar cookies! My dog will love these. Thanks for the recipe. That sounds good enough to eat. Almost like a cookie. That's so cool, Susan! Since we don't have pets, I never really thought about making treats at home for them but that is really neat!. So happy to see that Reya loves them! Well, you know that I spoil this puppy! Thank you, Emily! She is a stinker! Super cute for all holidays! My daughter makes ghost cookies and pumpkin cookies for us why not make "cookies" for you four-legged babies. Dogs love the holidays, too. This is a great way to treat them! thanks for the recipe. i'm gonna try this for my father in law's dog. Oh your baby is getting big! I am also allergic to peanuts so I can't use peanutbutter either. I will have to give this a try I know my babies would love them. I know! Its hard to believe how big she is, Melinda! Isn’t it frustrating that most dog treats are made from peanut butter? I was struggling trying to find a great substitute that was healthy for so long, and our vet recommended sunbutter. Reya LOVES these treats! I am hoping to have little ‘doggy bags’ this year for our trick or treating pups! I 100% agree! Its so hard finding healthy treats for our dogs! This is perfect, we just got a new doggie! It's our first Halloween with Alex too. 🙂 Thanks for the recipe and I can't wait to try making the treats. Hope your pup loves them, Rhonda! Make sure to show me pictures on Facebook! what a cute puppy, who doesnt love a treat! I have 4 dogs who love treats, I'll have to try this recipe. I like the recipe. I'm going to try it. I buy my dogs treats, but sometimes they just won't eat them & it's really nice to know exactly what's in them..& to know they aren't filled with dyes and preservatives. Wow, great job, I'm sure my dog would love those treats too. I'll have to make a batch instead of buying them from the store. Thanks for the recipe! Thanks for the pin, Jennifer! i have a few of my own and this will be a nice addition to my doggie treat recipes! btw your dog is super cute love the coat! Awww – thank you! 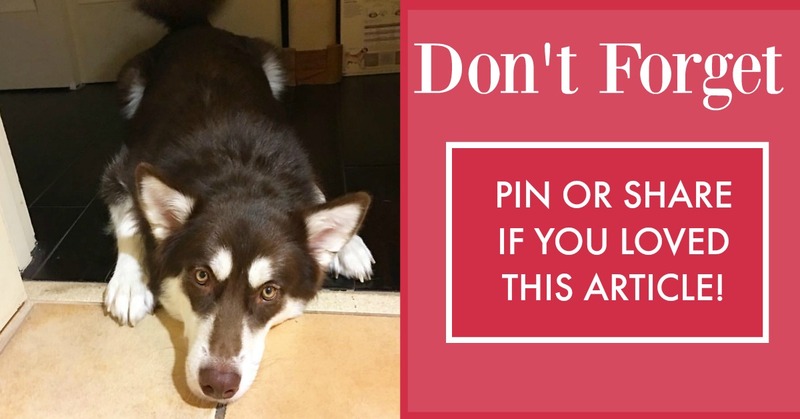 I hope your dogs love this recipe as much as my Reya! Those treats look great. I'm going to make them. My dog is so picky. I hope he likes them. My dogs love treats but they are getting expensive, so I have been looking for a way to cut that cost and still get them yummy treats, these look super easy to make. I am going to give it a shot and make my babies some homemade treats! Thanks for the recipe. Cute dog! Maybe soon I can set aside some time to try this. It looks like a really good recipe. These are awesome! I'm going to try them for our dogs. Thanks! And thanks for adding this to my Halloween Linky! I really appreciate it! You have a wonderful blog! 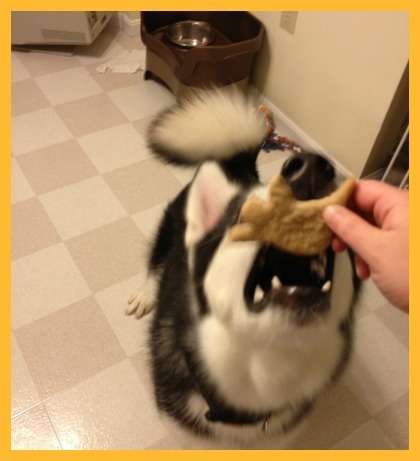 I love that you made your own puppy treats! In my case it's my dog that has allergies so I don't buy him treats very often. I would have to make my own too. Thanks for sharing your spooky puppy treats! These treats are too cute! Our dog loves people food, but these treats definitely look healthier for him. Would love to see more of these recipes. What a great treat for dogs. I make dog treats for x mas every year for family's with dogs. I too use Whole wheat flour, but mine are made with peanut butter. I really wish I could use peanut butter but with my peanut allergies it wouldn’t be a good idea. My poor Reya has never had peanut butter for that reason! I'm going to try and make these and see if my puppy likes them! Thank you! So sweet. Noone really thinks of pets when trick or treating. This ia a great idea so that they can have a safe treat. This is a great recipe. i worry about all the stuff in dog treats. These are the cutest things. How creative of you Susan. First of all the idea of making homemade dog treats never occured to me. 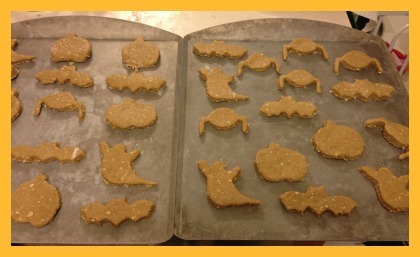 Then add in the Halloween cookie cutter designs and you have a hit! So cute, and healthy too! These are so cute my dog would love them! I will have to make some for all the holidays and use different cookie cutters for the holidays! Your dog is so cute 🙂 That recipe looks really great! Dog treats that are all natural are so expensive, so it's great to have an alternative that is unexpensive to make. I have to try this. I have 2 very fat dogs because my boyfriend likes to give them like 10 of those crappy dog treats a day! I need something a little healthier. Where can I get the sunflower butter and coconut oil? These look super easy to make! I'm excited to try making them over the weekend. I'm sure my fur babies we gobble them right up! How sweet. Reya is lucky to have a mom who cares so much. Thanks for sharing! I have 3 dogs and I know that they will love these. Thanks so much for posting it! Can't wait to bake some and give them a treat. I love this idea! I know I have some fun cookie cutters just begging to be used for this. Thanks for the inspiration! This looks cute and i'm sure my puppy will enjoy. Thanks! Thank you for this recipe. It would be awesome to be able to give the pups a treat during Halloween that is goulishly scary, as well as healthy for them. Not to mention you can use the recipe during other Holidays. Like Christmas for sure, this would be a nice present for them. I will definitely be using this. Thanks again. My son is getting older and not really interested in our usual Fall/Halloween activities. I think this would interest him though. I have all the ingredients on hand too! This is a great idea! I am going to make these for my dogs this weekend! They have food allergies and I think these will work great for them without all the added things in the store bought treats. 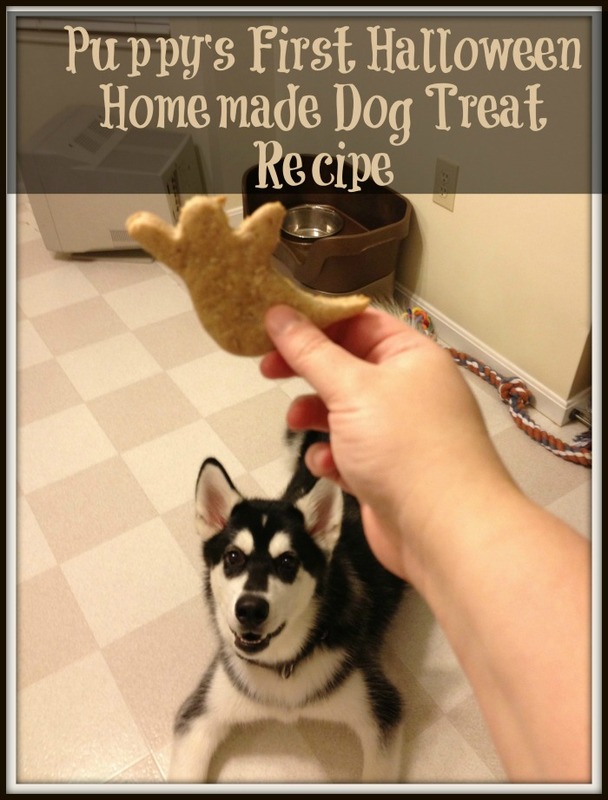 This is a great starter recipe to experimenting with making your own doggie treats. What a great idea! Great recipe I never thought of making my own dog treats before. 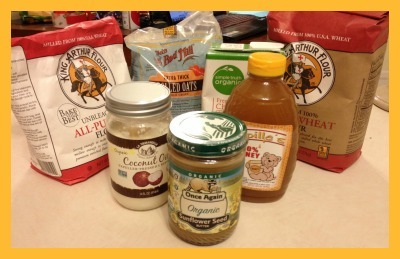 Thank you for sharing your home made doggie recipe! I think it's such a good idea to make our own these days with all the bad products on the market lately. What an awesome idea. I'm glad your pup likes them. I am gonna have to give this a try for my babies. I am going to have to try out this recipe! I have three dogs and they just hate the fact that they can't share in the candy so having their own goodies is just great. Wonderful! I have everything on hand but the sunflower oil. Can I substitute another oil? (I have coconut & Olive oil) My dog would love these…no matter what shape 🙂 Thanks! I never thought oof making my own dog treats, I'm going to give this a try. Thanks for sharing! Love these and will have to try to make them for our dog Maisy. She's an 8 year old Jack Russell and she has an extremely sensitive system (just switced her to organic dog food because of this), so I think these will be okay for her! Thank you for sharing!! My grandsons always try to eat my dog's treats! If I made these thy could 🙂 Great recipe. These Halloween dog treats are reakky cute, I think i am going to try these for my dog! I think my dogs would love these. Will have to make these. Thanks for the recipe. I have been wanting to try my hand at making them. I have 4 dogs so it gets expensive to buy them. Thanks for offering this great recipe. We only feed our little guy 'people food' so we know exactly what he is eating. I am sure he will really enjoy this treat. Keep up the terrific blogging. thanks for sharing. i am going to try this for my boston terrier. I have two dogs and I think both would love these, but I don't have all those ingredients on hand, so I'd have to get them first. Thank you for posting this recipe. I am gonna have to try these for our little girl Honey who is new to our family! This is so awesome!!! I always wondered how to make dog treats. I bet your dog really loved this. Thanks for the recipes. I will be trying this out oneday!! I'm so excited to find Halloween themed dog treats. Thanks for posting! What a great recipe. I think I will try this. My dog is always around when I'm cooking hoping I drop somethimething. She would be thrilled to find out I was cooking just for her. This is awesome my dogs would love these! Reya is so cute! I will certainly try this recipe.I believe that dogs should eat these kinds of homemade dog food. This recipe you provived us is much healthier than commercial food.Thank you. You are very welcome! She loves these treats & I love that they are so healthy! I have a 8 month old Great Pyrenees, I bet he would love these. He loves treats and I love for them to be healthy. This way I would know what was in them too. Your dog is beautiful. Thank you for sharing, I love to make Sorcha homemade treats. I have made chicken jerky for my dog before but these dogs treats would surely get eaten by my dog. She loves almost anything. Thanks for the wonderful recipe as I always prefer homemade as then I know what ingredients are in the treats. Oh wow are these ever the cutest! I don’t usually think way ahead about Halloween, but I must make some doggie treat bags with this. It’s going to be fun!